^ Light Rail and Tram Statistics: England 2013/2014 (pdf). Department for Transport: 2. 17 June 2014 [27 June 2014]. ^ Clive's Underground Line Guides: Jubilee Line. Clive's UndergrounD Line Guides. [26 June 2009]. ^ Various route options for the London Underground dating from the 1960s to 1980s. London Docklands Development Corporation. [17 April 2007]. ^ 6.0 6.1 6.2 6.3 Docklands Light Railway (D.L.R.). Exploring 20th Century London. [3 September 2009]. 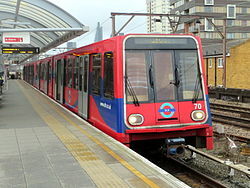 ^ Docklands Light Railway Extensions, London, United Kingdom. Railway-Technology.com. [9 July 2008]. ^ New Games transport link marks 20 years of progress. London 2012 Official Blog. 13 January 2009 [24 June 2009]. （原始内容存档于2009年5月28日）. ^ Hansard Written Answers. UK Parliament. 6 May 1987. ^ Ben Roskrow reports on Nuttal's extension of the Docklands Light Railway. Construction News. 16 February 1990 [25 June 2009]. ^ Widdicombe, Gillian. Architecture: A driverless train, a blighted destination. The Independent (London). 30 March 1994 [24 June 2009]. ^ Prescott backs DLR airport extension. New Civil Engineer. [25 June 2009]. ^ DLR: Take off for airport link (新闻稿). M2 Presswire. 18 February 1999 [25 June 2009]. ^ Withers, Malcolm. DLR helps Mowlem ride high at £25 million. London Evening Standard. 8 March 2001 [25 June 2009]. ^ Muir, Hugh. Mayor unveils £10bn scheme for capital's transport. The Guardian (London). 12 October 2004 [28 June 2009]. ^ Hamilton, Fiona; Coates, Sam; Savage, Michael. Docklands Light Railway reaches City airport. The Times (London). 6 December 2005 [25 June 2009]. ^ New DLR extension wins approval. BBC News. 26 February 2004 [24 June 2009]. ^ AMEC, RBoS jv finalise contract for DLR extension to Woolwich Arsenal. Forbes (New York). 6 January 2005 [24 June 2009]. ^ Tunnel extending Docklands Light Railway to Woolwich completed (新闻稿). Transport for London. 23 July 2007 [29 June 2008]. （原始内容存档于2007年9月28日）. ^ Mayor unveils DLR Woolwich Arsenal station (新闻稿). Transport for London. 12 January 2009 [19 March 2012]. ^ Tower Gateway Station – Now Open. Transport for London. [21 June 2009]. （原始内容存档于2009年7月2日）. ^ DLR Terminal suddenly reopens: Taking passengers by surprise. East London Advertiser (Ilford). [21 June 2009]. ^ Barrow, Keith. Olympic rail gets a head start. International Railway Journal. July 2006 [12 March 2012]. ^ Longer trains for Docklands Line. BBC News. 31 July 2007 [24 June 2009]. ^ Extra carriage on every DLR train (新闻稿). Transport for London. 3 May 2007 [10 June 2011]. ^ £20m bullet trains to serve Olympic Park (新闻稿). London2012.org. 28 September 2004 [6 July 2005]. ^ Major contract award signals start of work on DLR Stratford International Extension. Transport for London. 10 January 2007 [19 March 2012]. 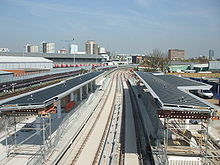 ^ New £211m DLR extension connecting Olympic venues opens. BBC News. 31 August 2011. 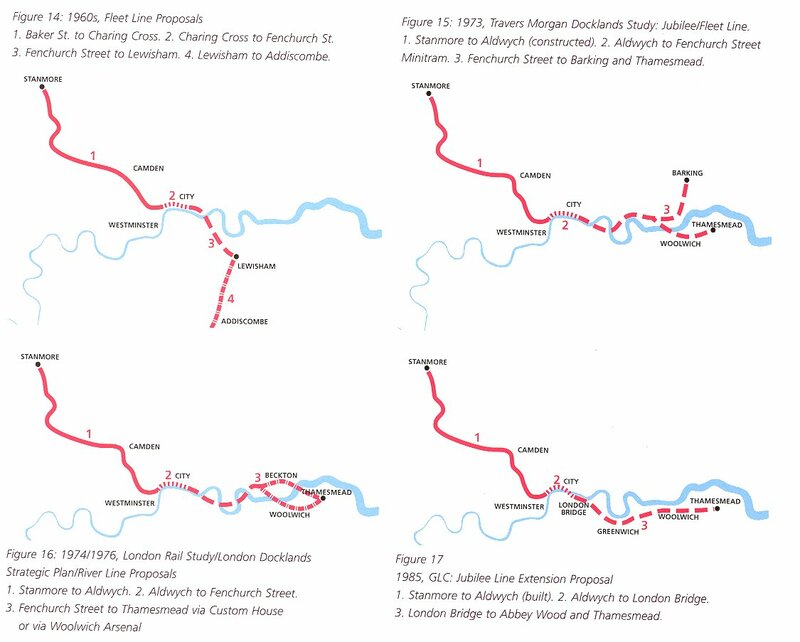 ^ North Woolwich Research: Changes, 2006–2008 – The influence of Docklands Light Railway (PDF). Social Research Associates. July 2008 [26 June 2009]. （原始内容 (PDF)存档于2011年7月16日）. ^ Unmanned Train: DLR Respond. The Londonist (blog). 2 November 2007 [19 March 2012]. ^ Bombardier receives a $94 million US order from Docklands Light Railway for automatic Light Rail cars to be used in London, UK (新闻稿). Montreal: Bombardier. 4 May 2005 [14 July 2009].